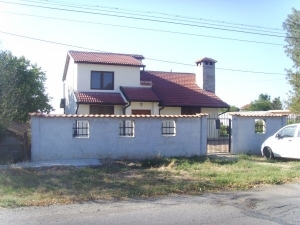 TOP OFFER – luxury house for sale ready to move in located at the charming Bulgarian countryside only about 13 km from the seacoast. PROPERTY DESCRIPTION: Two-storey house, new construction with perfect design, furnishing, disposition and location is waiting for the lucky new owner. The house is ready to move in. The property is built in 2008 with 153 sq. m. of living area. The floor is laminate, terracotta, fireplace with marble, air conditioner and luxury furnishing. FIRST FLOOR: Into big premise with 50 sq. m. of area are living room, dining room and a kitchen. There are also two bedrooms and bathroom with toilet on the floor. SECOND FLOOR: A bedroom disposed on 30 sq. m with air conditioner, wardrobe – 8 sq. m area and a bathroom with toilet. GARDEN: The yard is lying on 930 sq. m. The property has two drills hydrophore and special shaft to sewer. THE PRICE: If you want to buy this house with the luxury Italian furnishing the price is 95 000 euros and without the furnishing the price is 85 000 euros.